Southern junior Brody Dutton (14) looks to avoid a Wahama defender, during the Tornadoes’ six-point win on Sept. 8 in Racine, Ohio. Last Week: Nelsonville-York defeated Waverly 38-13, in Nelsonville; Meigs defeated River Valley 45-28, in Bidwell. Last meeting between the teams: Sept. 30, 2016, Nelsonville-York won 47-6 in Nelsonville. NYHS offense last week: 238 rushing yards, 175 passing yards. MHS offense last week: 301 rushing yards, 307 passing yards. NYHS offensive leaders last week: QB Garrett Maiden 7-11-1 175 yards, 2TDs; RB Colt Yinger 15 carries, 119 yards, 2TDs; WR Keegan Wilburn 3 receptions, 90 yards, 2TDs. MHS offensive leaders last week: QB Cory Cox 13-20-0 307 yards, 3TDs; RB Zach Bartrum 17 carries, 169 yards, 2 TDs; WR Weston Baer 4 receptions, 185 yards, 1TD. NYHS defense last week: 61 rushing yards, 158 passing yards. MHS defense last week: 108 rushing yards, 264 passing yards. 1. Nelsonville-York holds a 22-14 record against Meigs in the all-time series — which began in 1967— but the Marauders have split over the last four meetings. 2. The lone common opponent for these teams is River Valley. The Buckeyes compiled 583 yards in 49-7 victory over the Raiders in Week 4, while the Marauders posted a season-high in both rushing and passing yards in their 17-point win over RVHS last week. 3. Midway through the season, the Marauder offense has produced 70 first downs, 1,586 yards and 15 touchdowns. MHS has thrown for 10 touchdowns and ran for five, while also putting up a pair of special teams scores. 5. In the Region 15 playoff ratings, Meigs is currently 11th and is one of six teams entering Week 6 with a 3-2 record. The Buckeyes currently sit at the top of Region 23 and are one of five undefeated teams in their region. Last Week: Waterford defeated Frontier 49-7, in New Matamoras; Eastern defeated South Gallia 40-20, in Mercerville. Last meeting between the teams: Sept. 30, 2016. Waterford won 46-7 in Waterford. WHS offense last week: 194 rushing yards, 133 passing yards. EHS offense last week: 229 rushing yards, 115 passing yards. WHS offensive leaders last week: QB Peyten Stephens 6-14-2 133 yards, 2TDs; RB Braden Belleville 16 carries, 154 yards, 3TDs; WR Cody Harris 4 receptions, 82 yards, 2TDs. EHS offensive leaders last week: QB Nate Durst 9-12-0 115 yards, 5TDs; RB Josh Brewer 18 carries, 93 yards; WR Blaise Facemyer 4 receptions, 67 yards, 1TD. WHS defense last week: 183 rushing yards, 5 passing yards. EHS defense last week: 123 rushing yards, 26 passing yards. 1. In the last 21 meetings between the teams, the Eagles are 11-10 against WHS. Waterford’s last trip to Tuppers Plains was on Oct. 2, 2015 and resulted in a 35-7 WHS victory. The Eagles last defeated the Wildcats on Oct. 3, 2014 by a 16-7 count in Washington County. EHS last defeated WHS at East Shade River Stadium on Sept. 20, 2013. 2. Miller is the lone common opponent for EHS and WHS at this point in the season. The Falcons defeated Eastern 30-0 in Week 2, while falling to Waterford 35-25 in the season opener. 3. Midway through the season, Eastern’s offense has totalled 73 first downs, 1,282 yards and 17 touchdowns. On the ground Eastern has 934 yards and 10 scores, while the Eagles have posted 458 yards and seven touchdowns through the air. 4. Waterford enters play with a 12-game TVC Hocking winning streak. During the Wildcats’ streak, they’ve won by an average of 36.5 points per game, while pitching four shut outs. 5. In the Region 27 playoff ratings, Eastern is currently 12th, while Waterford is fourth. None of the 27 teams in the region are undefeated, but 13 enter week 6 with a winning record. Eight other teams join WHS with a 4-1 record, while Eastern is one of four with a 3-2 record. Last Week: Southern defeated Belpre 41-14, in Racine; Federal Hocking lost to Wahama 28-8, in Mason. Last meeting between the teams: Sept. 30, 2016. Southern won 45-14 in Racine. Current head-to-head streak: Southern has won 4 straight. SHS offense last week: 267 rushing yards, 103 passing yards. FHHS offense last week: 77 rushing yards, 72 passing yards. SHS offensive leaders last week: QB Logan Drummer 2-7-1 103 yards, 1TD; RB Riley Roush 25 carries, 166 yards, 3TDs; WR Dylan Smith 2 receptions, 103 yards, 1TD. FHHS offensive leaders last week: QB Hunter Smith 5-16-0 72 yards; RB Hunter Smith 18 carries, 55 yards, 1TD; WR Branden Gould 3 receptions, 46 yards. SHS defense last week: 121 rushing yards, 27 passing yards. FHHS defense last week: 316 rushing yards, 28 passing yards. 1. The Lancers hold a 11-10 record over Southern in the last 21 meetings between the teams. The last time Southern visited Stewart was Oct. 2, 2015, a game in which the Tornadoes claimed a 48-0 victory. 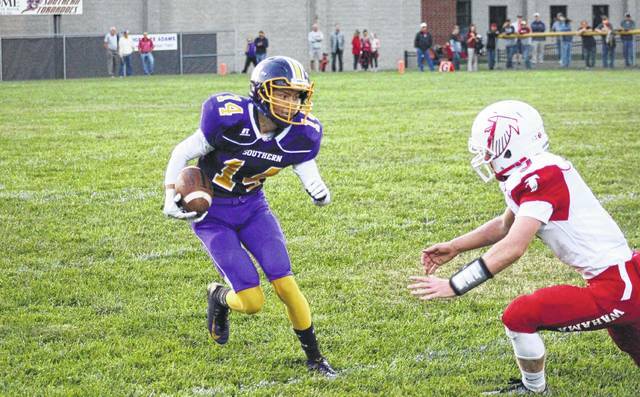 Federal Hocking’s last victory over the Purple and Gold came on Sept. 14, 2012, by a 14-7 final in Racine. FHHS last defeated SHS in Stewart in 2011. 2. Last week was Southern’s best offensive game of the year yardage-wise, and it was the third time this season surpassed 300 yards of total offense. It was also the third time this fall that the Tornado defense has held an opponent under 150 yards of total offense. 3. Of Southern’s 21 offensive touchdowns this fall, 20 have been on the ground. SHS senior Riley Roush leads the Purple and Gold with 14 rushing touchdowns through five games. 4. The Lancers have lost 27 consecutive games, including 21 within the TVC Hocking. In five games this fall, FHHS has been outscored by a average of 32.8 points per game. 5. Federal Hocking and Southern share two common opponents to this point in the season, in Belpre and Wahama. Southern defeated the Golden Eagles by 27 points last week, while topping WHS by six-points in double-overtime in Week 3. Meanwhile, FHHS lost to Belpre by 51 in Week 3 and by 20 to Wahama last week.